It seems hard to believe, but it’s been twenty years since the resistance to the large-scale open pit copper mining project began in Intag. Two decades. Almost a generation. During that time, the threat of wide scale destruction and social upheaval that often accompany these mega projects motivated Intag’s communities to organize and, with help of national and international organizations as well as strong local government support, they were able to force two transnational mining corporations to abandon the project. At the same time, they began working on sustainable economic alternatives, such as community ecotourism, shade-grown coffee production, artisanal soap and shampoo production, and the crafting of sisal handicrafts by several women-groups. The successful resistance, however, has come at a very high cost for human rights and the social peace so treasured by rural communities. And the costs keep adding up. For those of you unfamiliar with this struggle, Intag is situated in Northwestern Ecuador, amidst small farms, primary cloud forests and pristine rivers and streams. It is here that in the 1990s Bishimetal, a subsidiary of Mitsubishi, found evidence of a large copper deposit lying in the bowels of the biodiverse Toisan Range. Due to strong community rejection, however, in 1997 it was forced to abandon the project before completing exploration. We thought we had won the war. But it was not to be. Seven years later a Canadian Junior mining corporation tried to take over where Bishimetals had left off. Except that by then, the resistance to extractivism was much more organized and the Canadians were unable to even start exploration. This, in spite of spending millions of dollars to try to neutralize the opposition by coopting and or intimidating people into supporting them. The effect, besides serious and documented human rights abuses – including the use of paramilitary force against defenseless community members, was to create hideous divisions between families, friends and communities. Divide and conquer is one of the principal strategies used by transnational extractive industries whenever they meet opposition. Divide they did, but conquer they did not. To make a long story short, the Canadians lasted four years before they too packed up and left. We thought we had really won the war this time! But, alas, it was a premature victory call. In 2012 CODELCO, the world’s largest copper producer owned by the Chilean State joined with ENAMI, Ecuador’s state-owned mining company to revive the project as part of a government to government agreement. The new owners used similar tactics as the Canadians, but this time it was the State who was imposing the project with the support of all its institutions, including the police, and the courts. The onslaught against Intag’s resistance also counted with the aggressive support of Rafael Correa, Ecuador’s self- proclaimed progressive president, who on several occasions publicly slandered and insulted the project’s opponents. The new owners wasted little time in using the resources and powers of the State. On April of 2014 the police arrested and jailed Javier Ramirez, then president of the Junín community, hours after attending a meeting with the country’s Interior Minister in the country’s capital. He was accused of hitting an Enami employee in a stand-off between community members and company employees, in which no one was hospitalized or seriously hurt. Javier’s brother, Victor Hugo, was also charged with rebellion, but has avoided arrest. These stand-offs have been occurring since 1995, the year resistance to the project started, and the communities see them as a valid tactic to keep mining from devastating the peace in their community and their lands, as well as the natural environment. When communities – indigenous or otherwise – block roads or take similar direct actions, it is often to prevent mining or other extractive industries from carrying out their work, which is seen as a direct threat to their well-being. Why they choose this form of tactic, rather than using the judicial system, is subject of another, much longer, article but in general, one could say that they feel that their grievances, no matter how well documented, will not be given a fair hearing in court. Add to this deeply felt conviction that they do not have the same access to the halls of power as transnational do, nor the monetary resources to fight what they see as expensive losing battles in a playing field completely lopsided in favor of the corporations. If the mining corporation happens to be state-owned and if there is no effective division of power- as is the case in Ecuador- then the playing field is infinitely more uneven. Certainly history has proven the communities’ perception to be correct in the overwhelming majority of cases. Intag is no exception. To cite just one example, on December of 2006 when the Canadian corporation hired paramilitaries to attempt to, unsuccessfully, gain access to their mining concessions by shooting at defenseless campesinos the government did absolutely nothing to look into the numerous illegalities, including the illegal guns used against the community, nor did they investigate the companies that had hired the thugs, nor was the use of a military helicopter by the company condemned. The government also didn’t lift a finger to try to identify the shooter that wounded one of the campesinos in the leg. In fact, the way the State reacted to these and other documented abuses clearly demonstrate just how skewed the playing field is when communities confront transnational extractive interests, and how right rural communities are in their appreciation of the state of things. In this case, all was swept under the rug of impunity and, until this day, after eight years of a supposedly progressive government in power, not a single person has been charged or gone to jail for the blatant violations of national laws and human rights abuses. This might seem like a long prologue to justifying Javier’s actions on April 2014. It is not. For Javier wasn’t even there that day. When the incident that led to Javier’s arrest took place a Belgian doctor, who Javier works for, was treating Javier at home for a badly swollen knee as a result of a motorcycle accident. The doctor presented this evidence at court, but the judges only gave credence to government witnesses. The court’s ruling sent Javier to an overcrowded prison, where he spent ten months without being sentenced. He was freed the same day he was found guilty of rebellion, on February of 2015, and since then he’s been back in Junín with his wife and four young children. However, the mining company thought ten months was insufficient time spent in an overcrowded jail and they appealed the decision, as so did Javier, but to have the court declare his innocence. Incredibly, in April the appeals court agreed with the company’s arguments, and ruled he must serve two more months in jail. 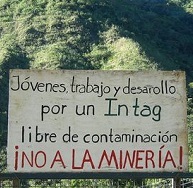 In their ruling, the judges took into account that Javier insulted government employees (mining workers). Imagine that, going to jail for insulting government employees! The human rights abuses and judicial irregularities affecting Javier and Victor Hugo Ramirez are so numerous that they have been denounced by several national and international human rights organizations, including Amnesty International and the International Human Rights Federation. Others are presently investigating their case. Why arrest Javier? Most people in Intag have little doubt that it was to remove one of Intag’s most effective activists from the scene and create a climate of fear and intimidation. That perception was born out a month later after his arrest when several hundred special-forces police stormed Intag and forced themselves into the mining area and imposing a de facto state of emergency in all of Intag. The objective was, supposedly, to accompany a handful of technicians so they could take samples and prepare the environmental impact study. The irony is that the study is riddled with erroneous or incomplete information. For example, it purposely left out endangered species, used meteorological information from totally different ecosystems, and based stream flow information on just one sample, to mention just a few of the mistakes. With help of experts, we opposed it and pointed out dozens of errors. But it was the State who mandated it and the State, in spite of the mistakes and omissions, who approved it. With the approval in hand, in January of this year, Enami and Codelco occupied part of the community-owned forest reserve used for tourism by the Junín community and rehabilitated a decades-long abandoned road without an environmental impact study, in order to bring the drilling equipment to the midst of primary cloud forests. As expected, tourism plummeted, affecting the livelihood of dozens of men and women. 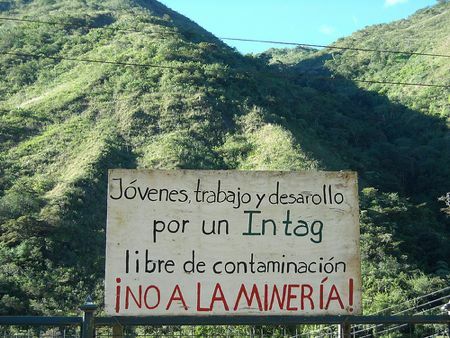 To further understand why people like Javier and his brother Victor Hugo and most of Intag’s communities as well as local government have mobilized for so long against the project, one also has to understand what is socially and environmentally at stake. In 1996 the Japanese exploring the Toisan Range released a report that included an Environmental Impact Assessment detailing some of the impacts a small copper mine would cause in a place like Intag. Though the study and impacts were based on only 20% of the copper they eventually found, the Japanese experts predicted there would be so much deforestation that it would dry up Intag’s climate. The primary cloud forest threatened are part of the most biodiverse of the world’s thirty-six Biodiversity Hotspots: the Tropical Andes. Furthermore, the mining site harbors dozens of species of animals and plants facing extinction, including jaguars, spectacled-bears and the critically endangered Brown-faced Spider Monkey. The Ecuadorian cloud forest is where many news species have recently been discovered including the Olinguito, the first mammalian carnivore discovered in the Western Hemisphere in the past 35 years, as well as several amphibians. These rare cloud forests also protect dozens of pristine rivers and streams which the Japanese said will be contaminated with arsenic, lead, chromium and other heavy metals. The Cotacachi-Cayapas Ecological Reserve, one of the most important protected area on the planet, would also be impacted. As much as the world has heard about Yasuni, from the stand point of irreplaceable biodiversity value, the Cotacachi Cayapas rates higher. This, according to a recent study that evaluated 173,000 protected areas for their biological irreplaceability. One of the impacts that mobilized people the most, however, was the social impacts the study identified, including the relocation four whole communities and an increase in crime. One of those communities slated for relocation is Junín, which Javier and his family calls home. This is no run-of-the-mill industrial project. The site’s hydrological, meteorological, geological and biological conditions guarantee that a large-scale open pit mine will be one of the most devastating mining projects the world has ever seen. If it all sounds bad to you, consider how it is perceived by the people in the area who have lived there all their lives. Then take into account that the following year after the study’s release, the Japanese discovered five times more copper. In spite of all the blatant irregularities and illegalities, exploratory activities started in the first week of May, but with permanent police protection. It could take three to four years to determine if the copper deposit is economically viable to extract. In the meantime, the human, social and environmental costs of the project keep adding up. If Codelco confirms the existence of a profitable copper deposit, and if the communities allow it, the next phase will be exploitation. Given Intag’s past, the latter one is a very big if.